Biological treatment processes, in combination with primary sedimentation, typically remove 85% of the BOD5 and soluble solids originally present in the raw wastewater and some of the heavy metals. Activated sludge generally produces an effluent of slightly higher quality, in terms of these constituents, than trickling filters or RBCs. When coupled with a disinfection step, these processes can provide substantial but not complete removal of bacteria and virus. 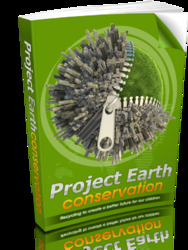 However, they remove very little phosphorus, nitrogen, nonbiodegradable organics, or dissolved minerals, and in an increasing number of cases this level of treatment has proved to be insufficient to protect the receiving waters from contaminations or to provide reusable water for industrial recycle. As a consequence, additional treatment steps have been added to wastewater treatment plants to provide for further organic and solids removals or to provide for removal of nutrients and/or toxic materials. These postprimary and/or postsecondary waste-water treatment processes are grouped into a category of treatment schemes called advanced wastewater treatment. In a way, advanced wastewater treatment can be defined broadly as any process designed to produce an effluent of higher quality than normally achieved by secondary treatment processes or containing unit operations not normally found in the secondary wastewater treatment. The treatment processes in advanced wastewater treatment can be simply a number of unit operations added to the existing primary and/or secondary treatment processes (sometimes, this arrangement is called tertiary treatment) or entirely stand-alone units of physicochemical processes, biological processes, or a combination of the above processes. The specific processes employed in advanced wastewater treatment may be similar to those used in primary and/or secondary wastewater treatment or they may be totally different from those in conventional wastewater treatment processes in order to remove the pollutants that either cannot be removed at all or be reduced to the quantity that is at the safe level. The applications of advanced wastewater treatment depend on the treatment goal of the effluents. Whether it is to remove excessive amounts of BOD/solids, nutrients, or heavy metals/toxic materials, advanced wastewater treatment has an important role in ensuring the quality of treated wastewater. The pollution problems arising from excessive amounts of certain nutrients in wastewater are the most common reason for advanced waste-water treatment and mainly caused by nitrogen-rich and phosphorus-rich compounds. The nitrogen-rich substances, such as proteins, are biologically converted into ammonia through a process called ammonification. The excessive amount of nutrients in discharged treated wastewater will lead to a problem called eutrophication. The eutrophication problem associated with algae blooms and deaeration of the receiving waterbody results from oxidation of ammonia to nitrate by the nitrifying bacteria (this process is called nitrification) and can suffocate fishes and other animals living in the polluted water. High concentrations of nitrate in water are toxic to both humans and animals. A schematic diagram in Fig. 5.1 shows the simplified nitrogen cycle in the environment. Another area of pollution problem associated with wastewaters, which is not addressed adequately by the conventional wastewater treatment, is the category of priority pollutants and volatile organic compounds (VOCs) identified by the regulatory agencies since the early 1980s. These pollutants are found to be toxic to humans and the aquatic ecosystem; if left untreated, the pollutants will enter the domestic water supply when insufficiently treated wastewater is allowed to discharge to surface water or groundwater. There are a number of physicochemical methods useful for nitrogen and phosphorous removal from wastewater effluents, such as ammonia air stripping and ion exchange; however, the high cost and low reliability of these methods have hindered their popularity. By far the most widely used method of nitrogen removal in practice has been biological processes. VOCs are found to be quite resistant to biological treatment, and physic-ochemical processes such as air stripping have their own limitations in terms of VOC removal from wastewater and may turn a water pollution problem into an air pollution quandary. 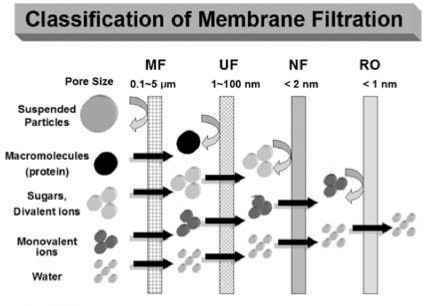 Membrane technology, particularly pervaporation, has now grown out of the perception of being an academic laboratory curiosity and has found practical use in various waste-water treatment projects (Peng et al., 2003). Figure 5.1. 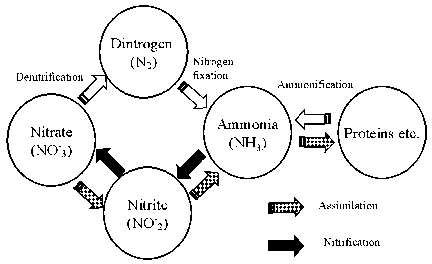 A simplified diagram of the nitrogen cycle in nature.